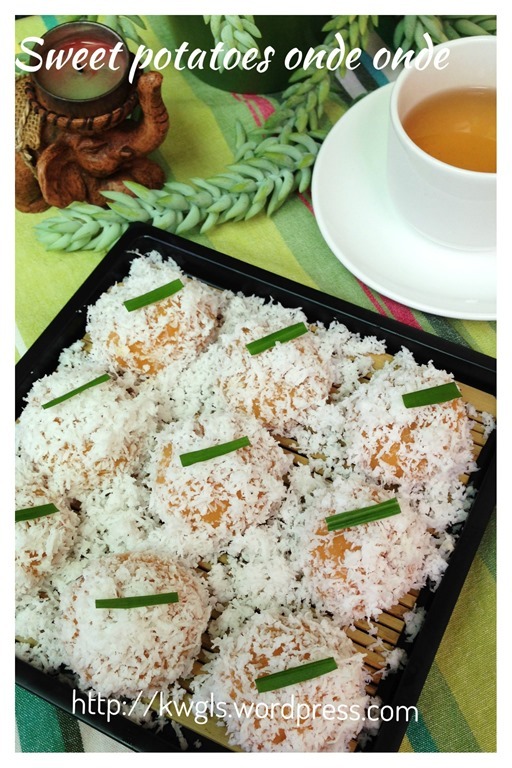 Today, I have prepared these sweet potatoes onde onde in my home town Sarawak. Since I am in my mother in law’s house, I thought I might as well prepared something for my wife’s family since they have been reading about my blog entries but do not have a chance to taste it. Hmmm, frankly speaking, I do not really like to cook in a kitchen of not my own. 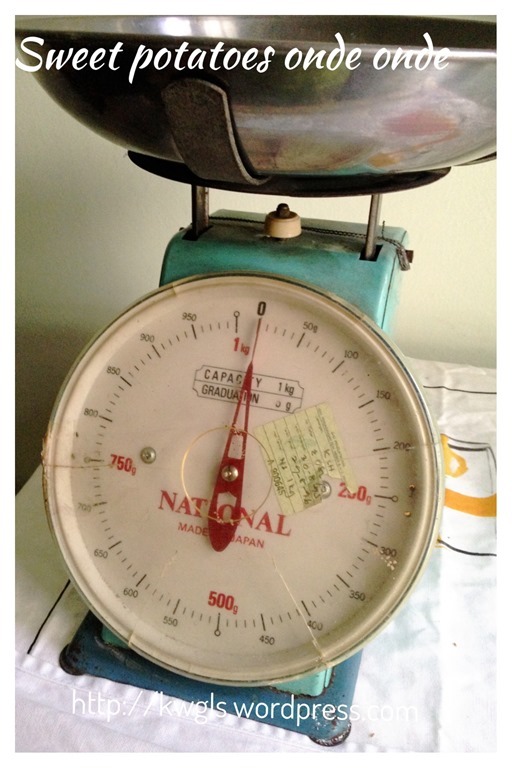 Not that they are not helpful but I have to ask from A to Z where they keep the plate and etc.…and in ended up I am using this to weigh my ingredients. 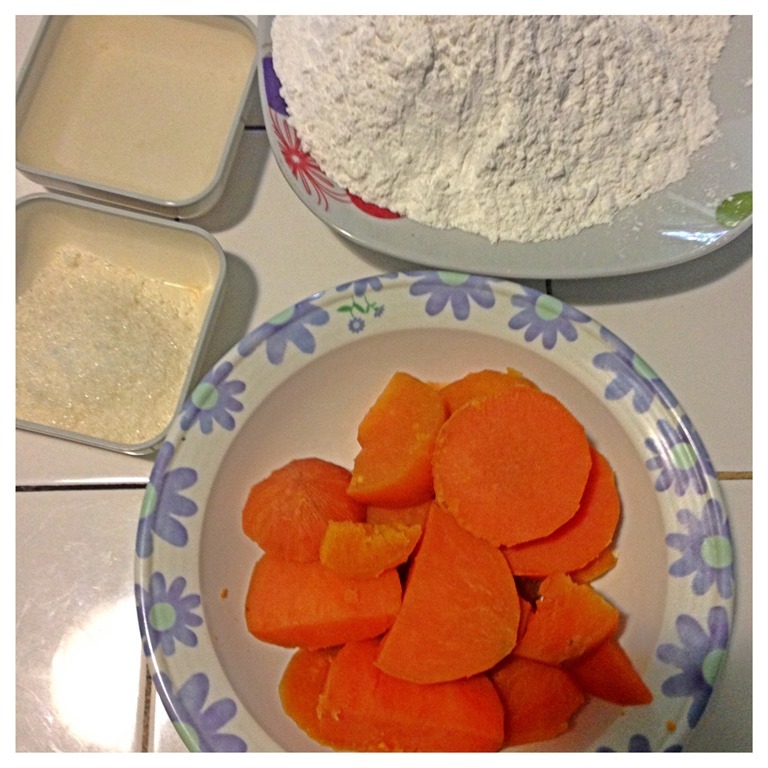 Taking into consideration the availability of raw material and my in law’s kitchen utensils and crockery, I have decided to prepare something simpler, sweet potatoes onde onde. In fact, I started to get unfamiliar with the town that I was born and raise after spending more than 20 years overseas. 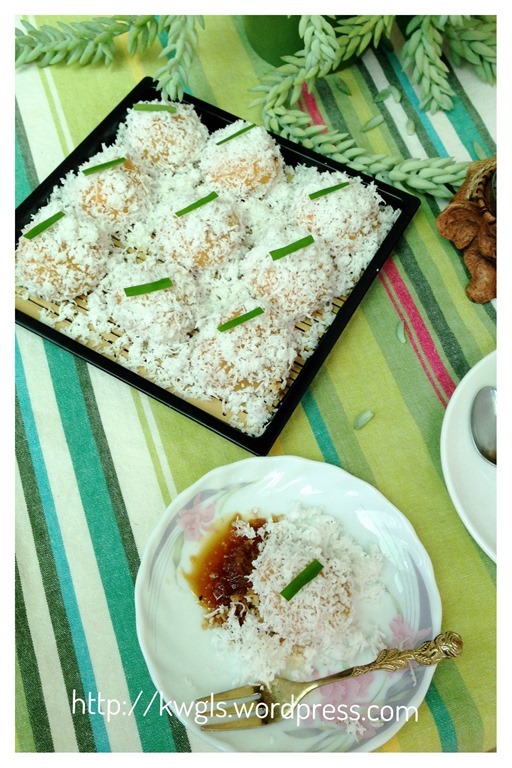 I have a hard time to get simple cooking ingredients such as shredded fresh coconuts. I have visited 4 stores and bag the last store to “do me a favour” so that they re-open the machine and sold me some fresh shredded coconut for me. Being in Sarawak, I have to take advantage of the local materials here. 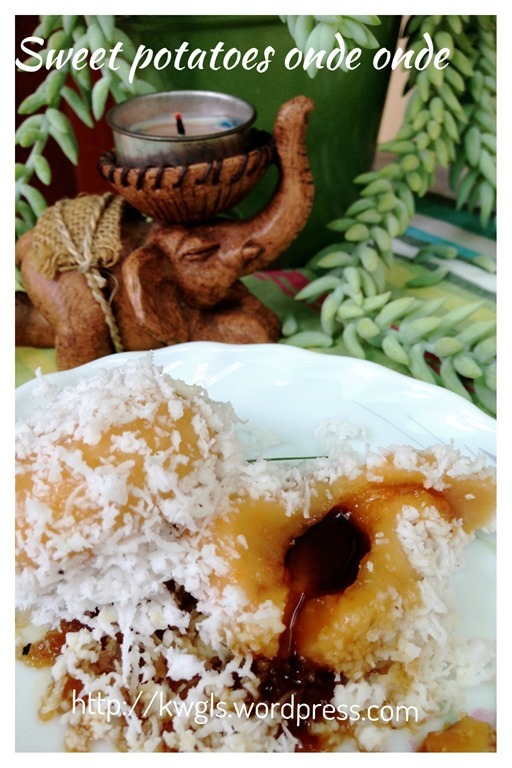 Gula Melaka or coconut palm sugar all this while is not a common sugar item in Sarawak cuisines. 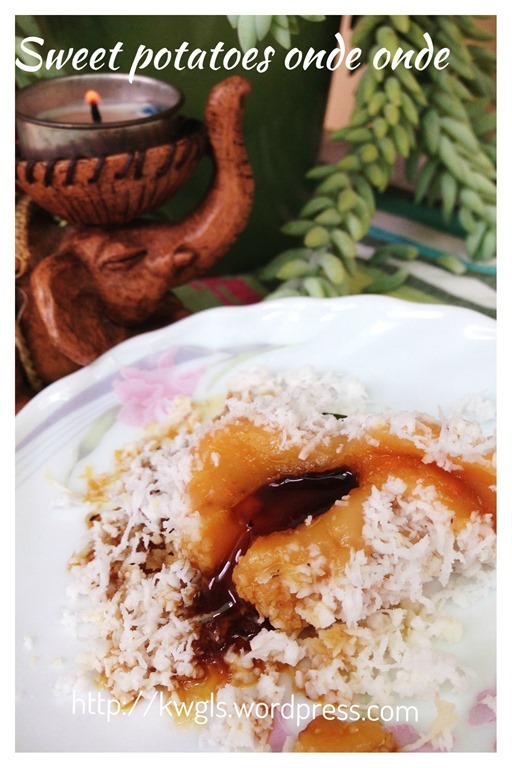 Instead, the Sarawak version of Gula Melaka is called Gula Apong, not from coconut palm but from another type of palm called nipah palm. (scientific name: nypa fruiticans). In my humble opinion, it is more aromatic than Gula Melaka. In fact, in recent years, price have increased tremendously due to demand exceeds supply.. 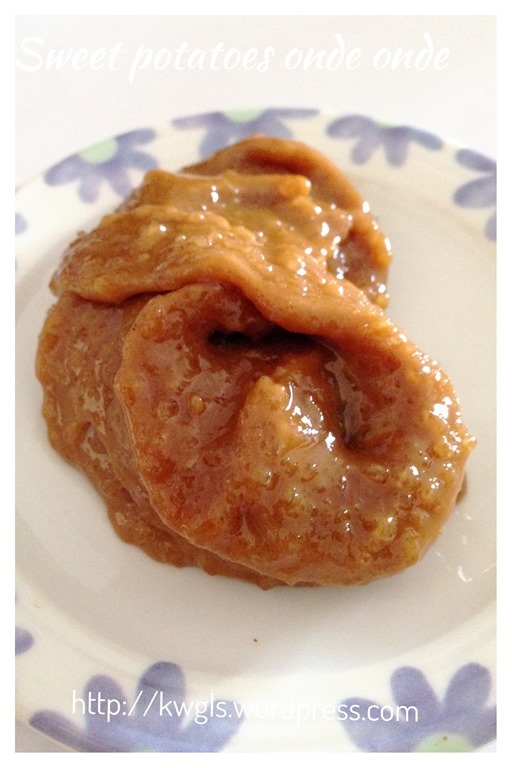 If you are interested to understand, you can read this translated articles on Gula Apong here. Skin, steam and mash the sweet potatoes, set aside for later use. 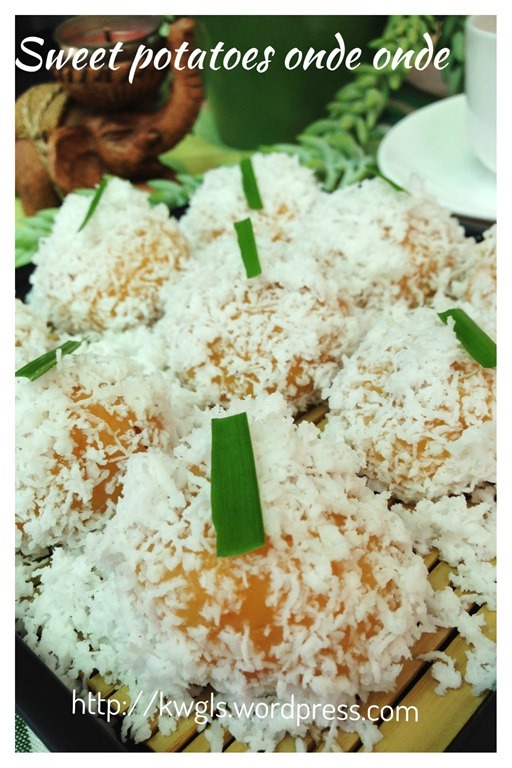 In a big bowl, put the glutinous rice flour, sugar, oil and mash potatoes. Gradually add in the lukewarm water until use hand to knead until well combined and become a pliable dough. 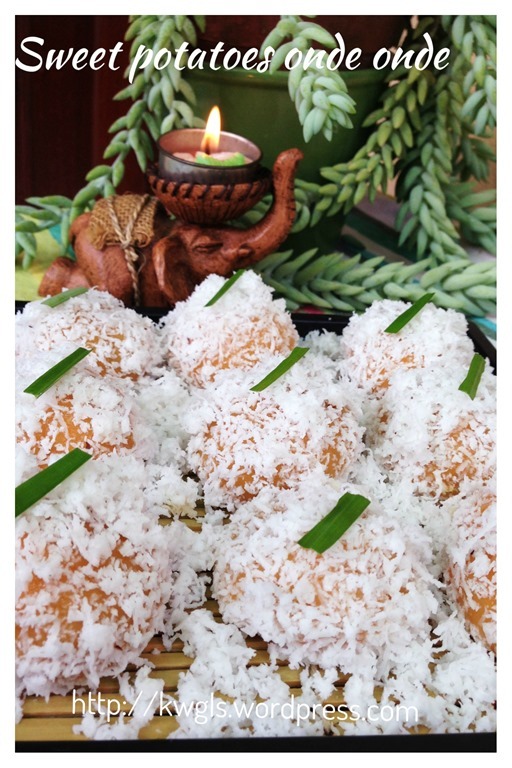 Meanwhile, in a steamer, place the grated coconut, 1/4 teaspoon of salt and the pandan leaves. Steam in the steamer for about 10-15 minutes or until the pandan leaves are soft. 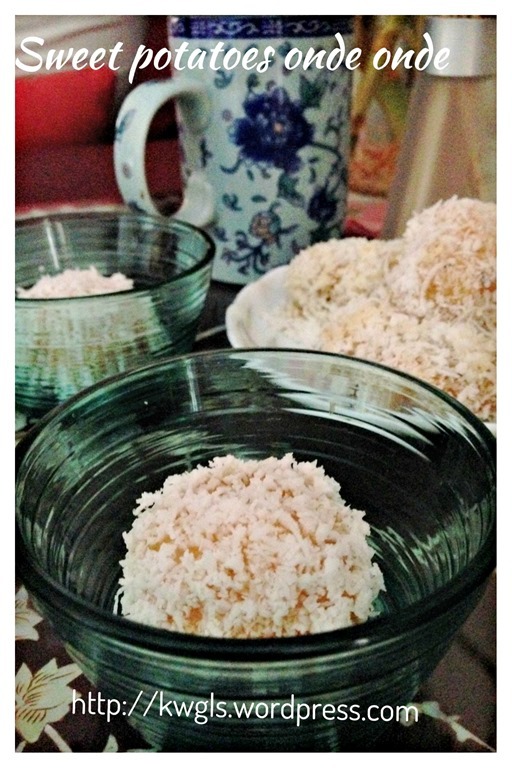 While the coconut is steamed, Divide the dough into 10-15 equal pieces. I have divide the dough into 30 grams each. 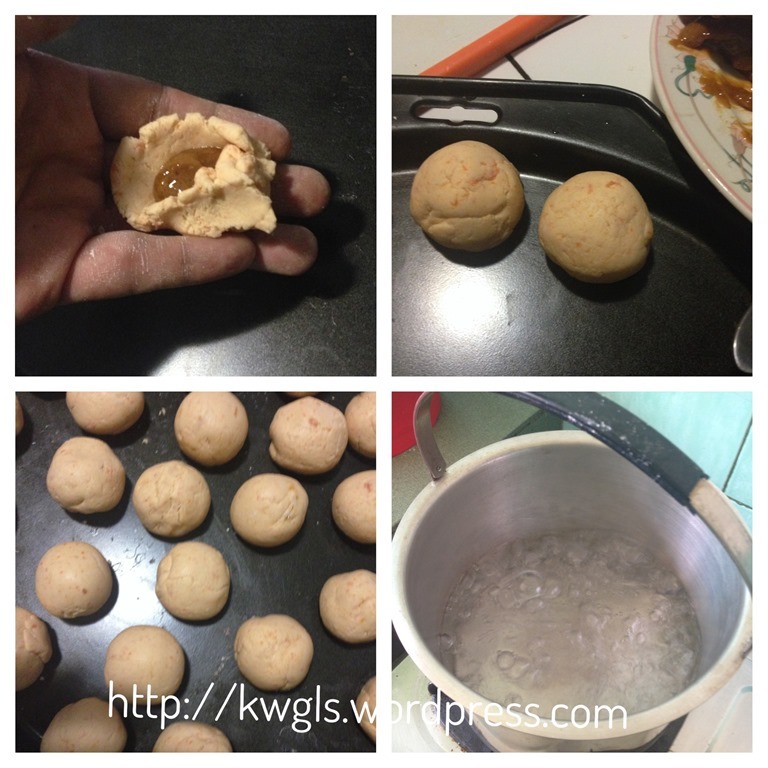 Take a ball, flatten eat, put a teaspoon of Gula Apong on the centre of the dough. 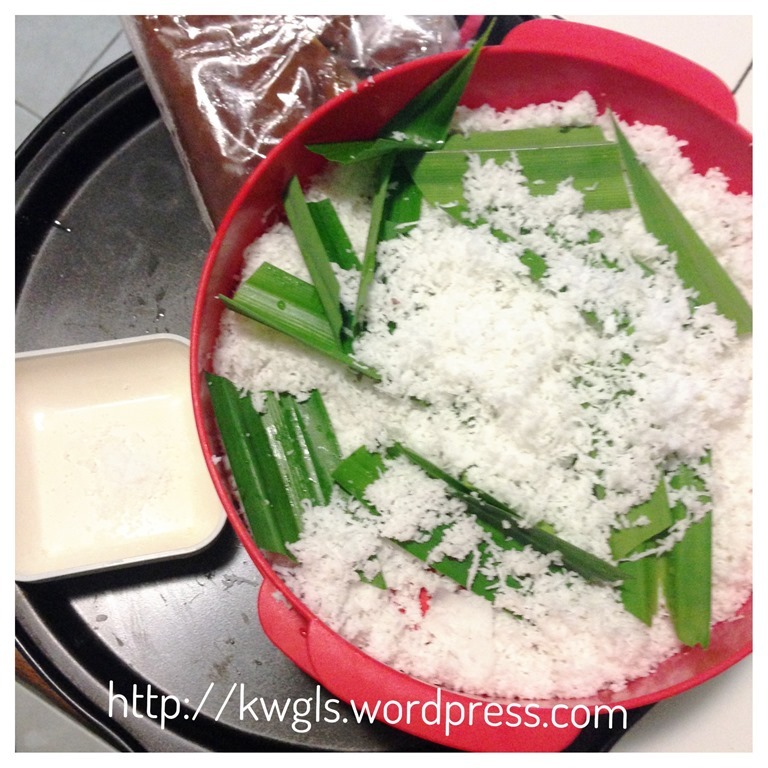 If you are using Gula Melaka, you will have to chop the gula Melaka into as fine as possible in advance If possible use mortar or pastel to pound it until fine. Seal up the edges and shape it round and set aside for later boiling. When all the balls are almost done, prepare a pot of boiling hot water. 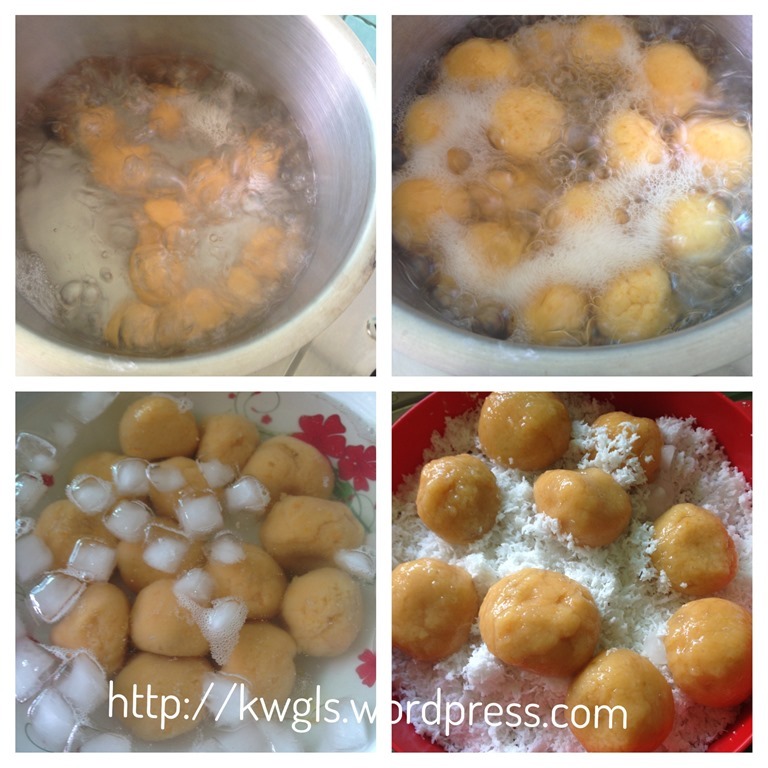 Put the sweet potatoes balls into the hot boiling water. Let them boil until all the sweet potatoes balls float up. When they float up, it means that the sweet potatoes balls are cooked. Scoop out the cooked balls from the pot and place them in the icy cold water. Let it rest in the icy cold water for 2-3 minutes before drain and transfer it out the steamed grated coconut prepare earlier. 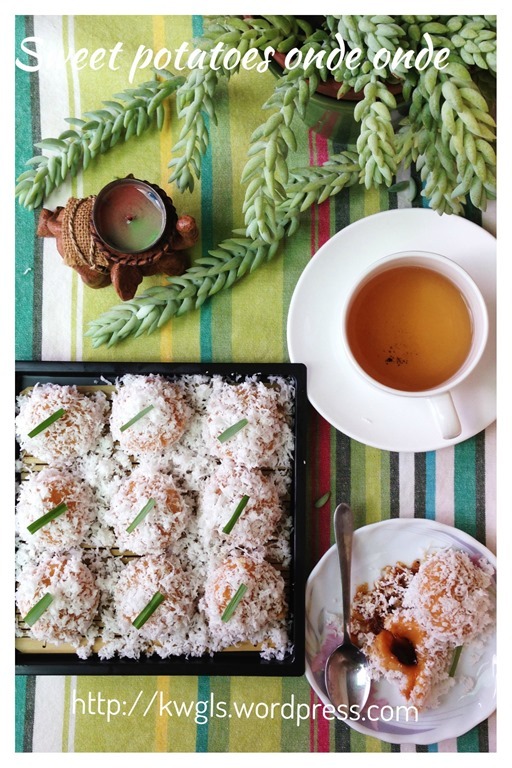 Best serve as a snack for tea time. This is not a difficult recipe. In fact, it is rather simple. 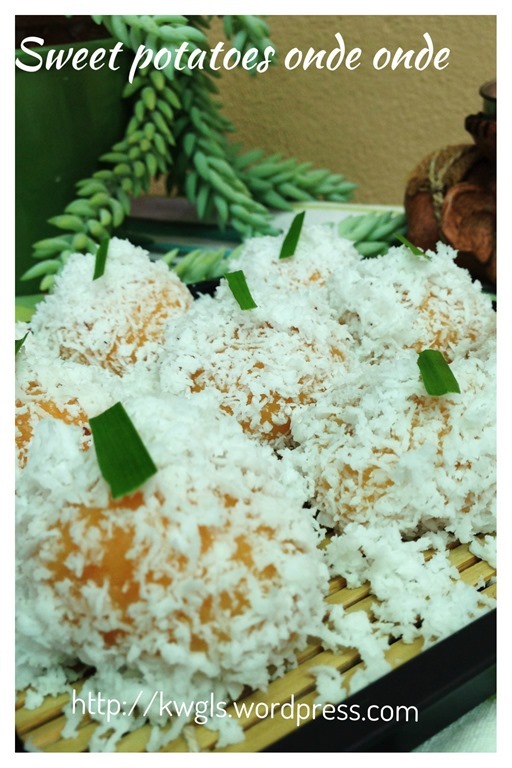 A few tips to share, if you are using Gula Melaka, it is best to pound the Gula Melaka until powdery to get the oozing effect when you take your bite. Secondly, do not be overly greedy with your filling. 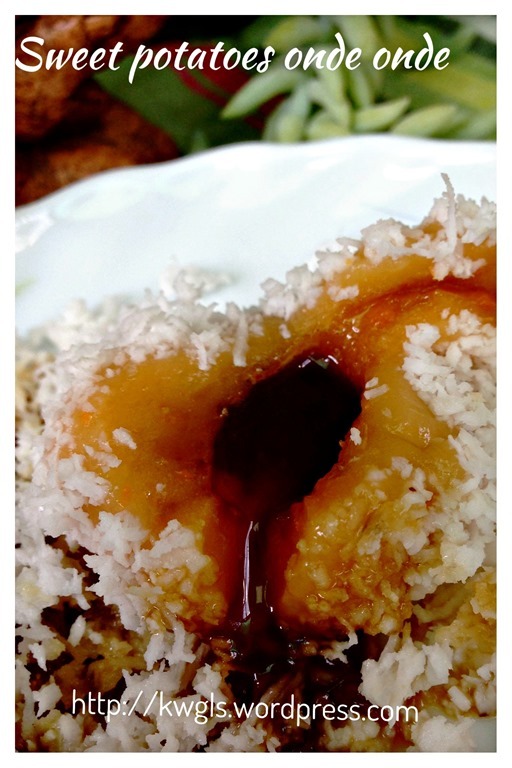 While it is good to be generous, too much filling can render the ball bursting when cooked . 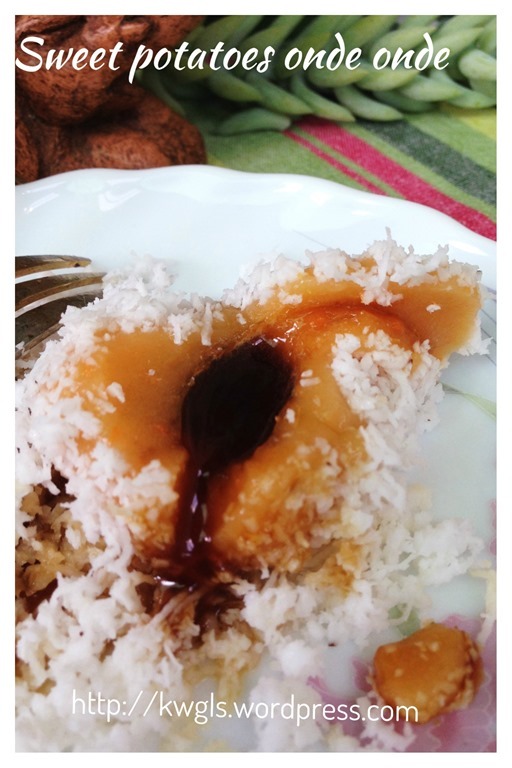 In addition, it may become overly sweet that may disappoint your guests. 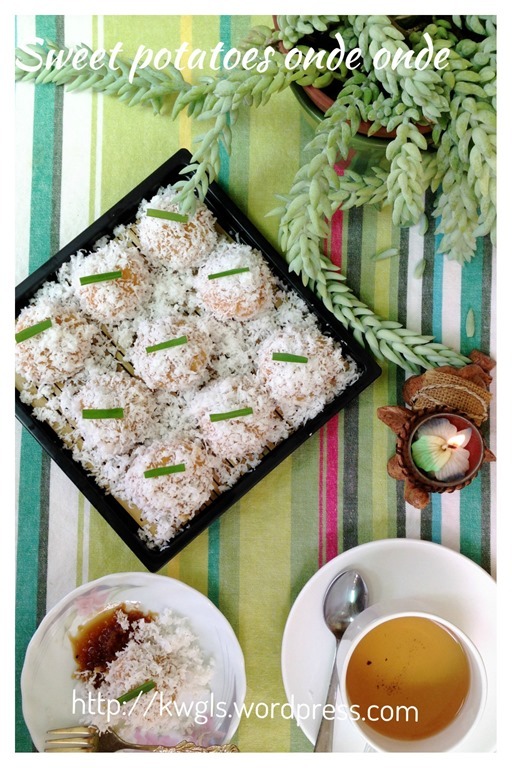 This entry was posted in Chinese and Asian Cakes and Snacks, Desserts, Food Preparation Series and tagged 8, 番薯椰丝糯米球, GUAI SHU SHU, Guaishushu, kenneth goh, klepon, kuih onde onde, kuih ondeh ondeh, postaday. Bookmark the permalink. Ha-ha… Congratulations. Nice to hear that! Hi, does the oil make the ondeh ondeh not that dry ? how to get the chewy texture? Yes. I thought this is quite chewy. 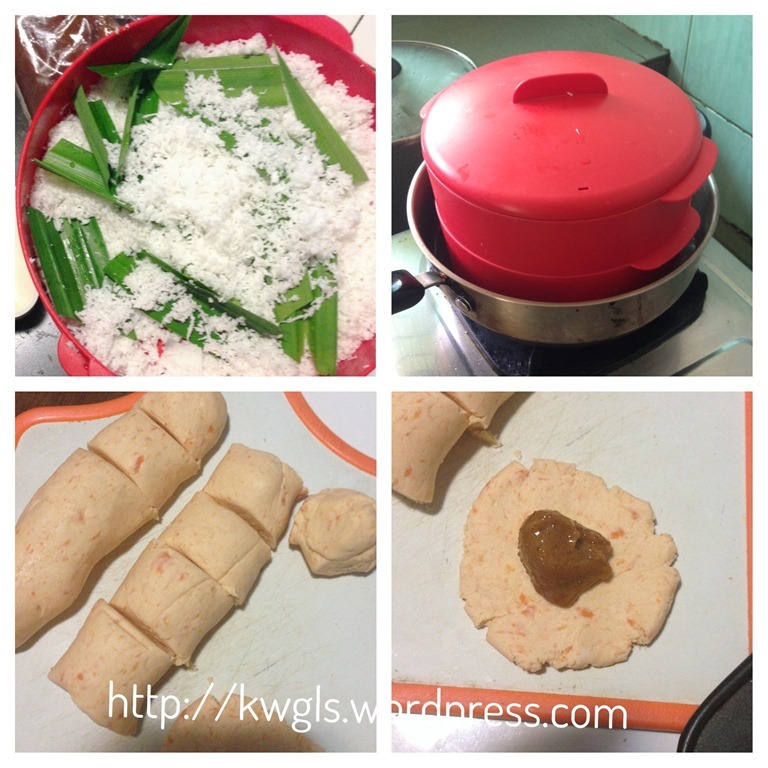 You can have more glutinous rice flour than stated in the recipe. 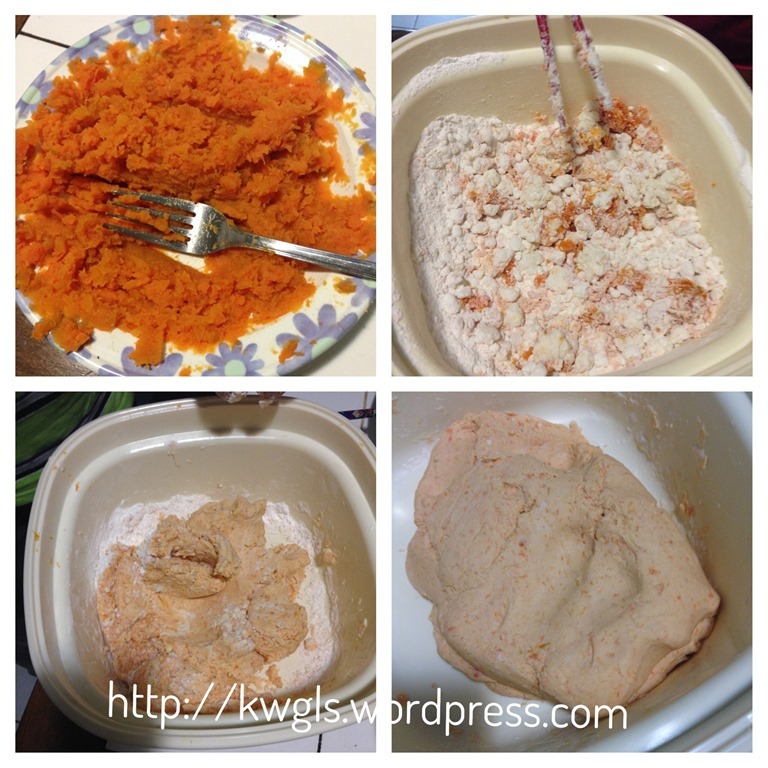 Hi Kenneth my ondeh ondeh turn out quite hard is it because dough need to knead longer ？ please advice …. Hard? Never heard of people commented as hard. I am puzzling too. Under cooked?